Strauss–Hofmannsthal, Der Rosenkavalier. Wiener Staatsoper, 12/26/2010. Production by Otto Schenk, conducted by Asher Fisch with Adrianne Pieczonka (Marschallin), Stephanie Houtzeel (Octavian), Daniela Fally (Sophie), Alfred Muff (Ochs). This was the 342nd performance of Otto Schenk’s production, which can memorably be seen on DVD conducted by Carlos Kleiber with Felicity Lott and Anne Sofie von Otter (the DVD with Kleiber and Gwyneth Jones is of Schenk’s similar but not identical Munich production of the opera). The sets have been restored and the costumes are new (though not very different from the old ones). It looks fine, though the low proscenium in Act 1 makes it feel small-scale. Act 3 also has a low proscenium. While this is appropriate for the inn, it makes things hard to see from the gallery level of the opera house, and the Ochs booby traps in particular don’t read well. The color palette still includes an unfortunate amount of beige. As one of the newspaper headlines put it, “No longer a visual ruin.” I guess that’s saying something. Not much, but something. The staging showed more detail and clarity in blocking than your average Staatsoper repertory night, with very few static moments and good interaction between the principals. However, neither the production nor most of the cast managed to leave an individual or memorable mark. 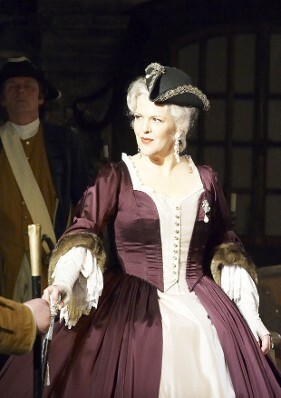 Adrianne Pieczonka as the Marschallin fared best. Her voice is smooth, gentle, never forced, and her diction and articulation of the text were excellent. She was a relatively youthful Marschallin, yet dignified and generally melancholy, lacking in a certain amount of Viennese irony. With the large exception of her touching, precisely observed monologue, she was also rather unassuming and modest in presence. Alfred Muff was direly unfunny and vocally exhausted as Ochs, with dry, nasal tone and a bafflingly complete lack of humor. Daniela Fally. subbing for the ill Ileana Tonca, was a charmingly acted Sophie, but too quiet in her lower register and more squeezed than floated in the upper. Supporting roles were perfectly competent but unmemorable, including Gergely Németi’s narrow-voiced Italian Singer. However, the Staatsoper can be counted on to do a solid job with the Orphans, servants, and so on. The orchestra was having a good night and played the score with fantastic technical polish and fine tone (I think they have had a lot of practice with this one). They were often too loud but I enjoyed hearing them anyways. Asher Fisch conducted a competent account of the score without a great deal of differentiation or flexibility. We can do better than this, can’t we? We can come up with something more original and memorable, no? 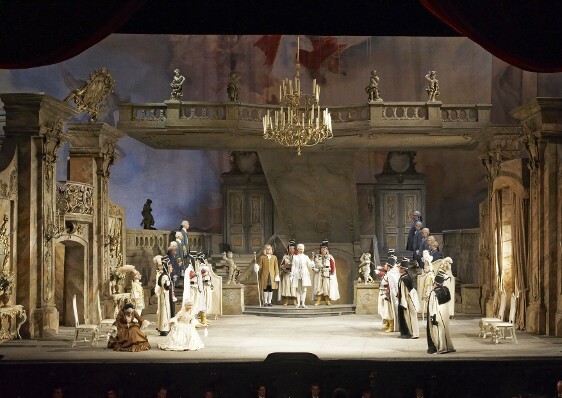 My attempt to find a more stimulating Rosenkavalier will continue at the Staatsoper Stuttgart in two weeks with a production by Stefan Herheim. For some reason I suspect it might be a little different. Also, can we talk about the Staatsoper website disappearing operas as soon as their runs are over? It took quite a lot of Googling for me to find these photos, and it was yesterday. Do you think Otto Schenk follows your project? "showing alarming signs of rehearsal"
Even with the pre-run warnings this sounds quite horrifying, indeed quite a bit more so even than your forthcoming Herheimian, Bietoan and Guthian adventures. The good orchestral contribution must have been appreciated. Lots of practice or not, the sloppy playing has been perhaps the most disappointing and shocking feature of my own previous Viennese Rosnkavs. Houtzeel is a babe but appears to be quite a bit bellow the Big League (really first ballot Hall of Fame in my book) Octavians of Garanca and Kirchischlager. (Are either of them still singing this role – I certainly hope so). The rest unfortunately seems predictably pedestrian. I suppose the new costumes and sets mean no new production for a while but even the old ones (last seen in 2009) seemed in better shape then the ones at the Met (where the whole show was also rather disappointing – Graham notwithstanding). Finally, wrt the cast, obviously excellence top to bottom is preferable but by far the best Rosenkavalier I've seen (to which I alluded previously) featured entirely unmemorable performances everywhere but for stupendous conducting and an out-of-this-world Marschallin which for me at least was more than sufficient. I can't say how much the sets and costumes have improved, because the only time I've seen this production before is the Kleiber DVD. All the newspapers seemed to think it was significant, though. I have in fact heard that Kirchschlager has dropped Octavian. Garanca I don't know, but it doesn't seem to fit into her current image very well, it's not that glamorous a role. Speaking of that, I must take exception of your babe comment–who the hell needs a babe for Octavian? And Houtzeel is a perfectly fine singer, she's just miscast. Sorry Zerbi, just an observation which certainly speaks in no way to the particular qualities one wants in an Octavian (although you'd have to admit that it helps if someone looks good in that suit). I was very much afraid that was the case with Kirchischlager. In fact she's seems to be doing much less opera and has done far too little at the Met. As for Garanca I suppose the role may not quite measure up to her new Uber Prima Donna About-Town spiel but I don't know why that should be the case. I'm not quite sure how to measure Star Status across eras but it seems to me that Christa Ludwig and Frederica Von Stade were divas of considerable standing and both sang Octavian well into their 40s. Perhaps Garanca has bigger pretensions than Susan Graham but the latter appears to be enjoying a long and celebrated career while having kept Octavian in her repertory (although she's done with him now as well). In any case its a shame because it is (imo, at least) her best role and she is almost unquestionably the best Quinquin around (although DiDonato should be very interesting). Perhaps she might condescend to do it in a new production at Salzburg or a major house. In any case, enjoy your Bavarian/Swabian Regiefest and Prosit Neujahr! 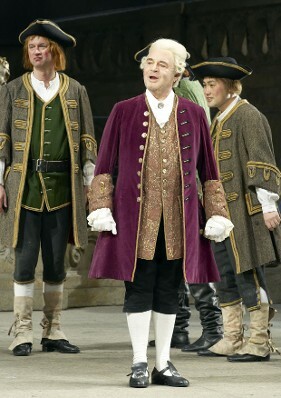 Just wanted to add this as a postscript: Garanca just sang Octavian in Vienna on April 15, 2012. Let's hope she keeps it in her repertoire because it was simply stunning.